As usual March convinces us that spring is just around the corner and that the cold, dark winter is behind us. And then wallop! We fall like a stone back into wind, rain and freezing temperatures. On the whole the winter has, in fact, been very kind with plenty of dry weather and warmish air. Strange how after a couple of rainy days all we can remember is the wet. As we barn all of our youngstock and brood mares they have all come through the winter looking well and bonny although it is noticeable how they now spend more time at the door than they have throughout the winter months. The hunting season has been great fun and the horses have enjoyed some lovely days out on the moor. We have one old horse who we keep especially for a regular hirer who hunts him at least weekly. Nick White celebrated his 80th birthday before Christmas and his horse, Buster, is in his mid 20s so they have a combined age of well clear of 100 years. They have shared nearly 300 days hunting together and they have an incredible partnership. If I ride Buster on exercise I can’t hold one side of him and if the girls ride him he can spook or whip around in the road at nothing, yet when he has Nick on board he is a saint and carries his passenger over some of the worst parts of Dartmoor, through rivers and jumps whatever he is asked to. I wish I could clone him, he really is one in a million. Foaling starts any day now and they come thick and fast for the next few weeks. We have the boxes all washed, disinfected and newly painted and the cctv serviced. The recliner chair is lined up facing the monitor so I am making the most of the last few nights in my bed. We have a good team of young horses in for show preparation and schedules and entry forms are starting to pile up so I really must get on with them. On the stallion front our new thoroughbred Primitive Proposal is going to be busy. He is exactly what we are constantly being told is lacking in UK breeding and that is a full Thoroughbred with limb, temperament and movement. We are really excited to have him and can’t wait to get started. In fact I have a mare of my own due to him very shortly. She is Langaller Starring Role’s sister by Prince Of Darkness so her foal will be very special. Returning by request is the 122cm riding pony stallion Wedgnock Flying Saucer. He has sired some cracking foals and breeders have asked to use him again and so we have snatched him back from his owner/breeder for a short season so that he can be used at stud before returning in time to cover his mares at home. 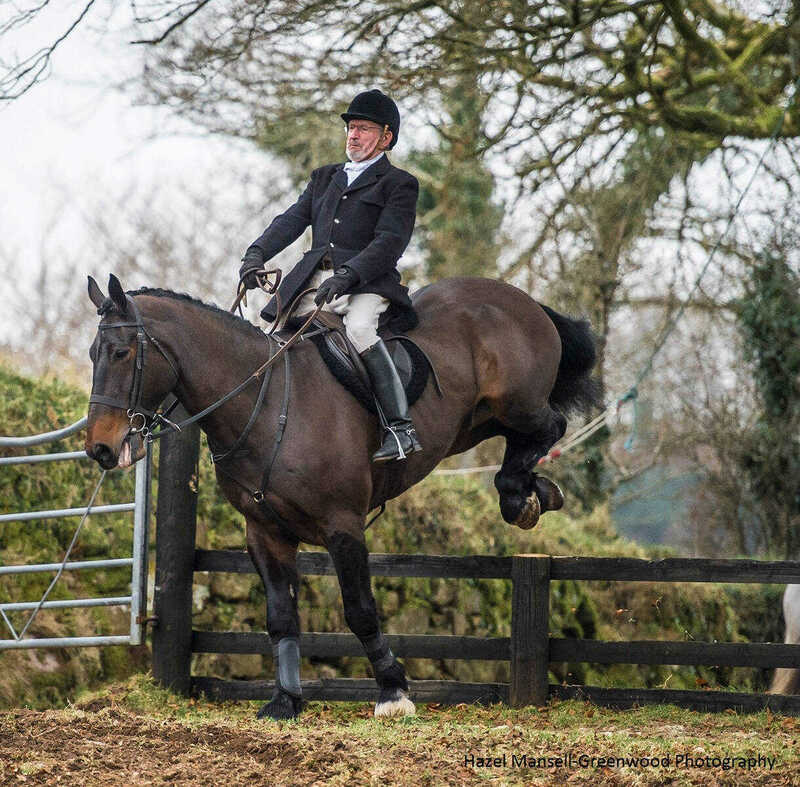 Resident Connemara Newtown Pedro has spent the winter in Warwickshire with Matt Cadman hunting with the Croome and the Warwickshire as well as competing at Dressage and show jumping. He may just fit in a day with the South Devon before they finish too. The other boys are all fit and raring to go. 2017, bring it on! Thanks to Harry Hall we now have smart new jackets at Langaller Stud. I did say that they are too good to wear around the yard but in fact they are so comfortable and warm, I notice they are being worn most of the time! I am guilty too, I love mine. It’s just so practical and lightweight and the lining keeps out all the draughts. We had them embroidered so that when we are out exercising around the lanes we will look smart and tidy and will be a good advert for the yard. THE HARRY HALL 2017 YARD VISIT PROGRAMME HAS NOW BEGUN, including one to event rider Tim Cheffings near Tiverton on Weds 19th April. Involving FREE exclusive tours to top competition yards they win rave reviews. Come and see, learn, ask, and go home with a goody bag.